There are so many things that we as a Christian congregation could look at. We have 66 books of the Bible to study, with numerous biblical figures, topics and subjects that overlap with our daily life. Where should we start? I can think of no better place to start than with Jesus. When we say we are Christians, we say we are followers of Christ. We better know who this Christ is. But how important is it to get the details about Jesus right? Isn’t close good enough? There was once was a pastor who was invited to attend a wedding. Unfortunately he was not able to attend but he did want to bring greetings at the wedding reception. What better way to get the couple off on the right foot than to have Scripture read at their reception? He decided that an appropriate passage would be 1 John 4:18, which reads, “There is no fear in love. But perfect love drives out fear.” What a beautiful passage. So the pastor, being technically inclined, texted the passage to the MC. It would take too long to text out all those word so he just sent 1 John 4:18. The only problem is that some how in the texting, the 1 was left out and the MC received John 4:18. That is fine as the Bible is the Bible and any Scripture passage is good. So the MC, in the name of the pastor, stood up and read John 4:18, “The fact is, you have had five husbands, and the man you now have is not your husband.” The lesson is that close is not good enough. 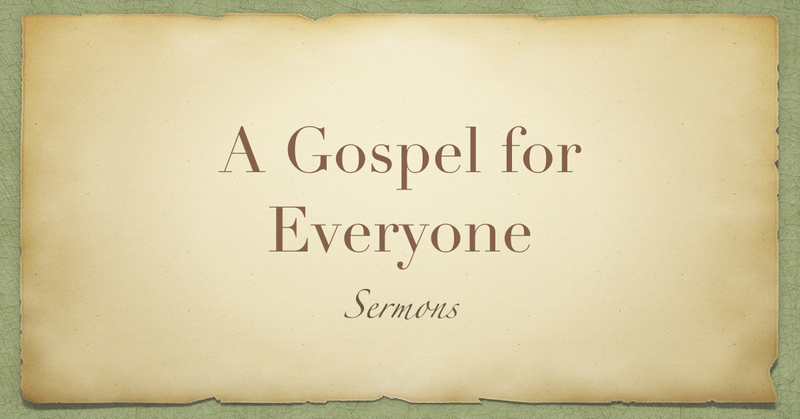 Today we are beginning a series on the Gospel of Luke. Why then did we read from Acts instead of Luke? I hope to make that clear very soon. We are going to begin with some of the events surrounding the birth of Jesus. Before looking at that, we need to remember a basic principles, especially in ancient writings. It was very common for authors to begin their work in a way that would hint at where they were going with their writing. For example, when we read Matthew, we can see at the beginning that he is interested in showing Jesus as the fulfillment of prophecy. When we read John, we can see he is interested in the big picture of Jesus as God incarnate. What does Luke have to say? To understand Luke’s intentions, it is important understand the Jewish context. It had been more than 500 years since Malachi the last prophet. Why were their no more prophets? Some rabbis had suggested that it was because God had removed the Holy Spirit. The Holy Spirit and prophecy were closely connected. You could not have one without the other. As the birth of Jesus approached, the people were still in an era without the Holy Spirit. Knowing that, let us see what Luke can tell us. So here we are, in a world where the Holy Spirit seems to be absent and prophecy has ceased. We want to be watching carefully for any changes in this situation. The angel has appeared to Mary and she is now pregnant with the Son of God. While they were both pregnant, Mary went to visit her relative Elizabeth. Are you ready for it? Elizabeth is filled with the Holy Spirit and she begins to prophesy. The spiritual drought has come to an end. But please note who God has used to end it. It is not Zechariah, even though he is the first person introduced to us by Luke. God chooses to use Zechariah’s wife, Elizabeth as the first Spirit-filled prophet of the new era. Considering ancient roles for women, this is very significant and it will be an ongoing theme for Luke. We are still waiting for Jesus to be born. Will anything else interesting come up? We see that at the birth of John the Baptist that Zechariah has something to say. Luke tells us that Zechariah was filled with the Holy Spirit and he began to prophesy. The Holy Spirit strikes again. Why is it important to have a second prophet? The Hebrew tradition requires that there be two witnesses to testify to the truth. God meets this requirement but with a twist. Instead of providing two male witnesses, which is what is expected, God gives his Spirit to a woman and a man. There is no way to miss that we are in a new era. Not long after, Jesus is born. What happens next? The parents take baby Jesus to the Temple. What do they find? A man named Simeon appears. We are told he has the Holy Spirit and he begins to prophesy. No sooner has Simeon finished that the family encounters a widow named Anna. What does Luke tell us about Anna? She is a prophetess. While Luke does not mention the Holy Spirit with her, everyone new that was required for her to be a prophetess. This is what I want you to see in this passage. There are four heralds of the birth of Jesus. Two, a male-female pair who prophesy, before the birth and two, a male-female pair who prophesy, after the birth. This brings us to Peter’s quotation of Joel’s prophecy in Acts 2. Basically this is a prophecy about the Holy Spirit being poured out. Not just poured out, but to all people, suggesting much greater inclusivity than what was know in the Old Testament. There is also mention of men and women, a rather radical idea for biblical times. There is talk of old and young and mention of servants also suggesting a breaking of economic divisions. Now this prophecy was fulfilled on the day of Pentecost which took place after the death, resurrection and ascension of Jesus. But notice what happens at Jesus’ birth. We have the Holy Spirit. We have male-female pairs. In the passage where Mary visits Elizabeth, we are told that John who was still in his mother’s womb, leaped for joy in the presence of the unborn Jesus. Since there is no other way John could have known this, this gives us a baby prophet to go with our older prophets. We have Zechariah and Elizabeth who were a priestly family who would have been fairly comfortable financially and Anna, who as a widow would have had no way to provide for ourselves. The Holy Spirit at work in the men and women, old and young and rich and poor. We get at the beginning of the Gospel the hint of what would take place at the birth of the Church. I want you to know that I am not interested in simply offering Bible trivia. Yes it is interesting that Luke includes these male-female pairs, but so what? Here is where things come together. At the very beginning of the Gospel, God breaks apart all the human barriers about who is in. There was an ancient Jewish prayer that was basically, “God, thank you that I am a Jew not a Gentile, a man and not a woman and a free person and not a slave.” Social status mattered. But social status does not matter to God and so God created a Gospel that was big enough for everyone. I need to make something clear. I am not suggesting a type of universalism where everyone is saved no matter what they believe or do. God still expects people to confess Jesus Christ as Lord. There will always be people who will reject his offer of grace. But the Gospel is offered to everyone, no matter what group they belong to. The Gospel is big. Really, really big. That is not to say that the Church has not tried to shrink it down to a more manageable size. The first challenge we see the early church struggling with is the inclusion of the Gentiles. The earliest Christians were very comfortable with the Gospel being for Jews and those who had converted to Judaism. But here is an important principle, God does not care if we are comfortable. The church has also tried to keep a limit on women. This happened so much that the church gained a reputation for being anti-women. But if you look at Jesus’ attitude toward women, you will see that he was in fact a radical for women’s rights. Even Paul, who often is blamed more than Jesus, had some amazing things to say about the role of women. Not much has changed in the last two thousand years. Most churches would be extremely happy if a tithing multi-millionaire started attending the church. One of the saddest stories I have heard came from a couple at my previous church. They were from Ireland and they told me that many years ago, there were people who wanted to go to church but were not allowed. Why? Because a certain dress standard was expected and the poorest in the community did not have the clothes to meet those standards. The Gospel is equally for the poor and rich. A last distinction is something not really dealt with in the Bible but the principles are there. What about the various traditions and denominations within Christianity? I thought we had the truth, how could God be working in that church down the street? When I made a personal faith commitment in my early 20s, I began attending a church that had a fairly narrow view of the Gospel. The people in churches with different views than ours were the “so-called Christians.” At the time I was attending Brock University and I got connected with the Christian group on campus. The problem was that many of them were from the “so-called Christian” churches. I immediately assumed that they didn’t have a real faith. Except when I got to know them and discovered that they had a deeper and more intimate faith than I did. God was quickly taken out of the denominational box I had made for him. We are just beginning to look at who Jesus is as presented to us by Luke. One of our questions we should ask is, who did Jesus come for? Did Jesus come for the atheist who complains about nativity scenes at Christmas? Did Jesus come for the Muslim refugees who fears that their new neighbours will assume they are terrorists? Did Jesus come for the child with significant developmental delays? Luke tells right at the beginning, in a clear way that Jesus came with a hammer to break all our human obstacles. Yes individuals are expected to respond to grace the God offers them in Jesus. But there is no group that is in a category of not welcome. The Gospel is for everyone.